1. Personal environments loosely joined. Rather than belonging to hierarchical and controlled groups, each person has her own personal environment and network. Based on their needs and preferences, different actors (learners, facilitators etc.) come together for a particular task or learning experience. They work together until the task is achieved and thereby do not have a permanent relationship with a formal organization or institution. 2. Personalized combination of formal and informal learning within a social context. 3. The mastery of new competencies and skills. In the new knowledge intensive society, new competencies and skills become increasingly important for better performance and thus have to be learned, continuously improved, and evaluated. Future competencies require the mastery of the 5 Cs: Content, Conversation, Connectivity, Collaboration, and Context. Furthermore, Learn-what referring to the high-quality learning resource that has to be acquired has to be supplemented with new crucial skills comprising learn who, learn where, learn why, and learn how. § Learn-who refers to the person or the entire community with the required know-how that can help achieving better results. Learn-who also involves the ability to navigate and learn across different communities. § Learn where refers to where to look for quality learning assets. § Learn why refers to the definition of effective learning goals. § Learn how refers to how learning occurs. It includes how to acquire new knowledge (e.g. through reading, professional training, discussions with peers, formal studies or research), how to apply knowledge effectively, how to generate, design, plan, structure, capture, store, evaluate, manage, use, disseminate, deliver learning assets, how to build a learning environment, and how to use the appropriate technology to achieve a given task. This new educational model requires a new form of certification and accreditation that I would call OpenDegree. OpenDegree is an open and decentralized certification system that aims at assessing the competencies and skills discussed above. Personalization: A PLE is characterized by the freeform use of a set of lightweight services and tools that belong to and are controlled by individual learners. Rather than integrating different services into a centralized system, the idea is to provide the learner with a myriad of services and hand over control to her to select and use the services the way she deems fit. Participation: A PLE driven approach does not only provide personal spaces, which belong to and are controlled by the user, but also requires a social context by offering means to connect with other personal spaces and networks for effective knowledge sharing and collaborative knowledge creation. In a Read/WriteWeb post, Sramana Mitra analyzes Flickr in terms of context, content, commerce, community, personalization, vertical search, and business model. The overall result according to Srarama was : Context: A-; Content: A+; Community: A+; Commerce: B-; Personalization: A-; Vertical Search A-; Overall Rating: A. Top 6 "Man of the year"
My colleague David pointed me to this video. With universal search, we're attempting to break down the walls that traditionally separated our various search properties and integrate the vast amounts of information available into one simple set of search results. Participation: A PLE driven approach does not only provide personal spaces, which belong to and are controlled by the user, but also requires a social context by offering means to connect with other personal spaces and networks for effective knowledge sharing and collaborative knolwedge creation. During the last 2 days I´ve been attending PROLEARN General Assembly at the Knowledge Media Institute of the Open University in Milton Keynes, UK. Different issues such as research achievements, future directions, and organization of next PROLEARN events have been discussed. The summer school will be again one of the major PROLEARN events this year. PhD students from all over the world who are mainly working in the area of technology enhanced learning will come together for a whole week to discuss their research ideas and get feedback from more experienced scholars. Lectures from the morning sessions will be recored and made accessible via the PROLEARN Academy Website. I´m really looking forward to this interesting event. A nice post by David Lenehan on Widgets. A Web widget can be best described as a mini application that can add functionality to your web page, blog, social profile etc. If you find a widget that you like, you simply copy and paste some code and add it to the HTML of your web page. Photo galleries, news, videos, advertising, mp3 players and pregnancy countdown tickers! You name it, there is probably a widget that does it. 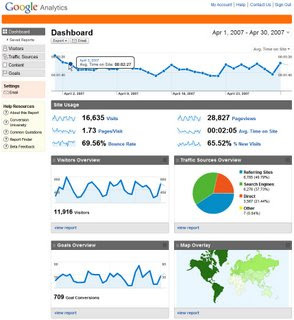 On the Google Analytics Blog and the Official Google Blog, Google announced a new version of Google Analytics. We've redesigned the reporting interface for greater customization and collaboration. This should make it easier for businesses and website owners to find and share the data you need to make informed decisions. The new version presents data more clearly and in context, so you can look at a single report to gain insights rather than having to pull up several reports to understand what action to take. At a conference organised by the University of South Denmark on Scaffolding learning - web 2.0 and e-portfolios, Graham Attwell gave a presentation on Personal Learning Environments. The audio of the presentation can be downloaded here. a new initiative around support for OpenID, a decentralized, web-friendly single sign-on mechanism that allows consumers to reuse a single login across different websites, tackling the "login explosion" problem. OpenID is currently limited to facilitating low-risk transactions such as blog comments. Through its new initiative, Sun is exploring what changes and practices are needed to make OpenID applicable to a broader spectrum of business and IT challenges. The company will actively encourage participation from customers and technology partners through a series of activities and real-life implementations that are initially driven by Sun's Chief Technologist's Office. A lot of companies have started supporting OpenID one way or another (Radar post -- Microsoft supports it in Vista, Yahoo's Authentication APIs can be made to support OpenID, and AOL will be an OpenID provider). However, Sun is the only one to make it more of an employee tool instead of a consumer one. In an earlier post, I put together a list of interesting resources on OpenID that I´m trying to update regularly. RailsBrain takes the usual "list of methods down the left" approach, but couples it with some nifty AJAX and a very quick server to serve up the docs in record time...If you're already using GotAPI, this isn't likely to interest you, as what it offers is no better, but is just easier to use on the quick. Yahoo Photos will be shut down by the fall. Users will be directed over a three-month period to transfer their images to Flickr or other photo sites such as Shutterfly, Kodak Gallery, Snapfish or Photobucket. Yahoo says it will make the transition easy, with a one-click transfer process...Charlene Li, an analyst with market tracker Forrester Research, says Yahoo needed to make the change because photos on Yahoo couldn't be tracked in search engines. 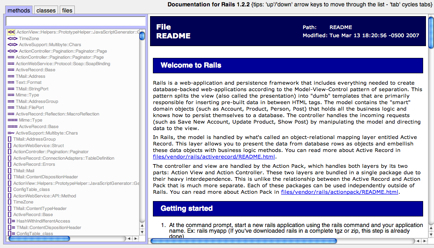 A nice guide that provides several good Ruby on Rails resources and tutorials on the Web. Well worth a look! Janet Clarey from Brandon Hall Research has written a report on the basics of E-Learning entitled "E-Learning 101: An Introduction to E-Learning, Learning Tools and Technologies". I have 2 remarks to the report, first I agree with Jochen and cannot see what 101 stands for. Second, in the report there is little about the new Web 2.0 technologies and their potential use in E-Learning. For a while now, we Googlers have used a bit of shorthand to refer to the Personalized Homepage -- a name that connotes interactivity, the Internet, and personalization all at once. Please meet iGoogle, the new name for the Google Personalized Homepage. Google has also started offering personalized gadgets (iGadgets?) that users without any programming or web design knowledge can create. An interesting article by Renee Fountain on wikis in education. Article abstract: This article endeavours to denote and promote pedagogical experimentations concerning a Free/Open technology called a "Wiki". An intensely simple, accessible and collaborative hypertext tool Wiki software challenges and complexifies traditional notions of - as well as access to - authorship, editing, and publishing. Usurping official authorizing practices in the public domain poses fundamental - if not radical - questions for both academic theory and pedagogical practice. Stephen Downes and George Siemens pointed to a recent report by The Australian Flexible Learning Framework on Networks, Connections and Community: Learning with Social Software. Report summary: The research investigates the use of social software in teaching and learning and in capability building and contributes to our understanding of the ways in which the development of social softwares broadens opportunities for organisations to deliver flexible learning both to internal and external clients. Prof. Dr. Mohamed Amine Chatti is professor of computer science and head of the Social Computing Group in the Department of Computer Science and Applied Cognitive Science at the University of Duisburg-Essen. He has a diploma degree in computer science from the Technical University of Kaiserslautern in 2004 and a PhD in computer science from RWTH Aachen University in 2010. His research focuses on Social Computing, Web Information Systems, Data Science, Visual Analytics, Learning Technologies, Learning Analytics, and Knowledge Management. My dissertation Personalization in Technology Enhanced Learning (ISBN: 978-3-8322-9575-2) has been published by Shaker Verlag, Germany.